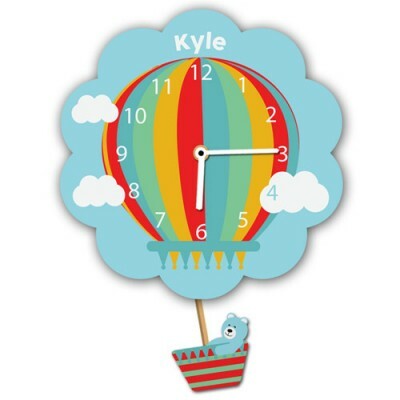 This Personalised Wall Clock features a Blue Hot Air Balloon Themed design with the cutest little Teddy in a basket pendulum. The Clock features a silent tick German quartz movement and pendulum for quality and reliability and is powered by a single AA battery (not included). The clock has been designed and cut to shape to add character. All clocks are cut and printed in the UK. Not only will "little ones" enjoy the design and character, they will also have great fun learning to tell the time. Personalised with a first name.